Frances Whitehead is an artist working in the Chicago/Gary area of the great lakes basins of the USA. She is a professor at the School of the Art Institute of Chicago andwas in Dunedin for the Art and Future symposium at Otago Polytechnic. She brings the methods, mindsets, and strategies of contemporary art practice to the process of shaping the future city. Questions of sustainability, culture change, and participation thread through her work as she integrates art and sustainability at the scale of the city. Sam: Welcome to Sustainable Lens: Resilience on Radio, a weekly show on sustainability topics brought to you by Otago Polytechnic. The show is co-hosted by Shane Gallagher and me, Samuel Mann. Shane is not here tonight, but I’m with Frances Whitehead who is an artist working in the Chicago/Gary area of the great lakes basins of the USA. She is a professor at the School of the Art Institute of Chicago and she’s here for a symposium at Otago Polytechnic. Thank you for joining me. Frances: Glad to be here. Sam: Let’s go right back. Where did you grow up? Frances: I grew up in Richmond, Virginia on the East Coast, Middle Atlantic area of the US. Sam: What was it like growing up there? Frances: I wasn’t aware of it at the time but there are two things that have really stuck with me from growing up there. One is a preoccupation that the culture has with its own history and to the point where perhaps it’s almost ancestor worship. The other is that Virginia has four real seasons. I didn’t understand that every place is not. When I moved away, I discovered that every place doesn’t have seasons that look like what shows up in the calendar. That was maybe the beginning of me realising at that place which has become a big issue for me. Frances: I come from a family of artists. I always say art is the family business. Early on, I’ve always been interested in science and I’m quite good in higher mathematics. I’m a Sputnik Baby as they call it, meaning that when the space race from the Sputnik launch was started, they took a bunch of us and taught us what was called the new math. I’m a new math kid. That interest in math and science coupled with my own family background in art, I think set me going where I am interested in both of those areas in the quals and the quants and I find no conflict between them and for me art is science and vice versa. It’s all inquiry. It’s all ways to understand the world. I think that got me going in a particular direction that has stayed with me. Sam: What did you do about that when you left school? Frances: I went to art school and I think that that was the undertow of my family heritage that in the end, I couldn’t do it any other way. It took me a long time to figure out how to bring my other interests back into the mix. Sam: What sort of art did you do? Frances: You mean as a young person? Frances: As a young person, I primarily focused from printmaking. It took me some time to realise that what I liked about it was the equipment in the room which are big mysterious machines with cranks and making images on sheets of copper or images on stone that appear and disappear and that it’s a kind of alchemy that transpires in there. That actually was the process that interested me. Somehow the prints were always a disappointment. I did a lot of lithography. Gradually, I came to realise it was the equipment, and the rocks, and the bottles of acid, and chemistry that interested me. After I graduated, after I already had my MFA which in the states is your terminal degree, I became a sculptor on my own, outside school. In terms of what became my home-based discipline, sculpture is the big tent, but that’s another story. In terms of that, I’m self-taught I suppose. I set upon a course of work that I began to try to figure out first how domesticity might inform creative production and that led me to make a series of what we might call metaobjects. I didn’t have that language at the time, but in retrospect that’s what it was. That was participating in the theory we might now call deconstruction, but we didn’t have that language then. That was an analysis of how classification in taxonomy actually helped us but also hinder us from understanding what’s in front of us. That eventually morphed into a post-industrial look at industrial artefacts because by then I had moved into Chicago and we were moving into the post-industrial although no one had that language or the postmodern, no one had that language. Eventually, I began to garden while I was in the city. We might call that the pastoral response although I didn’t have that language. The question of nature in the post-industrial city crept in organically over a period of 20 years and eventually that career making objects about that condition that I was exhibiting in galleries and museums, I began to have an unease about that practise because it seemed to disconnected from what was going on around me which was the environmental degradation around me. I began to feel it. I gradually became politicised around environmental issues. I would say around 2000, I discovered this emerging discourse that we now call sustainability. Of course it had been around for a while, but nobody was talking about it really. I became aware of it. Once I became aware of it, I always tell people it completely captured my imagination that I am not working out of a sense that will … Maybe a little bit now, but primarily I’m not working out of a sense of social responsibility. I’m working out of a love affair with complexity because it turns out I have a pretty complex world view and that was always a problem. My interests in complexity was a problem because in reductive, essentialized, academic and professional circles, they weren’t broad enough. When I discovered sustainability, it was a way to use my worldview and my appetite for complexity which was a way to use all of my art, math and science capacity in a way that was interesting instead of it becoming always a liability. Sam: If we take a step back, you were talking about the galleries style of work that you did, the nature and the industrial city. Did that come from a wider society, care for the earth, Earth Day, perhaps protest movement or what was driving that? Frances: I was really dealing with these subjects philosophically and even psychologically. I was not at all an activist. I think I had become a climate activist or an activist now, but I have never been a rabble-rouser type activist. Actually much more attuned to what we might call subversive tactics. For example, I have become quite a chameleon in terms of being able to enter the habitués, the world of another discipline, learn to speak their language, understand their values, priorities, methods so that I can connect the dots so that I can collaborate meaningfully. My activism has been … I joke that I’m a double agent working both inside and outside art. Inside and outside civic arenas, inside and outside science as a way to punch holes in disciplinary walls to allow ideas to flow more freely, but that includes art, turning back on art to change art and to change artists and to change the imaginary of what an artist might be in society. I’ve never really been the activist that you’re describing. Sam: You said you were politicised in about 2000. What brought that on? Frances: As I was describing, I had began to garden and this garden that I had next to my house, without me knowing it was actually a reclamation project because the detritus from the building that had been there kept coming up out of the ground. I would reach out to pick up a piece of fluff and it would turn out to be an 8 by 12 rug that was in the soil. It was coming up out of it from some house that have been there before. It was an unintentional reclamation project. After a few years of this, the condition, this post-urban condition was so all round me that it began to actually rattle my beliefs in the family business, in the art that I was making which was seeming increasingly irrelevant. Even as my first moves were to take these themes, environmental themes and move them into the gallery, I quickly became dissatisfied with that because I felt it was pretty clear, I was preaching to the converted. I went from making object sculpture about post-industrial to bringing even living plants into the gallery out of the garden to eventually realising that the garden was the laboratory that had pulled me out of the studio, into public, into public practice, into collaboration with living entities, into confrontation with degraded soils and systems, but also into conversation with neighbours, into working with living systems. It was a step by step process that went on since the mid-80’s and evolved over a 10 or 20 year period. Sam: I missed a step in there … In your garden you were realising that it was a place of urban decay or something that you were trying to reestablish. Tell me nice and slowly what’s linked between that to being critical of the family business? Frances: I mean, you’re basically asking me to recount a history that was not quite so linear. There were many things going on at the same time. I’m teaching at an art school. I’m continuing to participate in the discourse of what we could call normal art in the Thomas Kuhnian sense where he calls normal science and post-normal science. I’m participating in normal art, meanwhile over a long period of time I’m having this garden which is teaching me things as a citizen and I’m capturing some of these insights and I’m trying to bring them into my practise because as an artist there’s no keeping insights out of your practise. They come in and it changes you, but exactly what to do about that took a while. At some point, I began to have this anxiety about what I’m doing, but it was beyond language. It was very intuitive. It was felt. It was not thought. At the same time, I’m teaching at the School of the Art Institute and the school coughed up in an organic way several of us who were having anxieties around the changing conditions about the challenges that that ultimately would make for art practise, again was beyond language. It was felt. One of the people that came forward was actually coming out of the technology sector and had questions about the impact of technology which is of course now very flushed out. We began to realise as a school of art that we couldn’t take on the environmental impacts and the societal impacts of technology in the built world without having a design school. We began to join with a few other faculty to create a design school with the School of the Art Institute. This became what we called the design initiative. We had been a fine arts school, no design to speak of. Now, we have a full-blown design school that we created during this time. In the process of this design school, we began to talk about what kind of design school we wanted to be. We brought in some intellectual leadership in the form of design theorists, Clive Dilnot who brought with him Tony Fry who’s a sustainability theorist from Australia and quite a famous guy. They began to run these really faculty development workshops. This was in about 1998, 1999. I didn’t know anything about design except that I could tell that the largest impacts on the natural world were being created by what we could call design. They were not being created by what we can call art. Just the scale of impacts. That was very interesting to me and Tony Fry was so persuasive about the importance of considering this thing, this theoretical construct called sustainability and that’s where it captured my imagination and began to require that I reinvent myself. The revelation that that was required took some time and then the ability to formulate question and then a platform and then move into what you might call action research to see what those cultural hypothesis might lead to, that took another 10 years. How’s that? Did I connect the dots for you? Sam: You did indeed. You said before, you said a sentence which I really liked which was that your work is a confrontation and conversation with living systems. You went on to say living systems and the social systems around them. Frances: I don’t think I wake up in the morning and think about confronting living systems anymore. I’m too respectful of living systems. I’m not interested in being confrontational. Maybe I was talking about the collision between traditional arts thinking and the realities as they were revealing themselves as we came to understand the interconnectedness. We’re talking about systems thinking now. This is me on a private level doing that thing that so many people have done now which is to begin to see the limits of what can be achieved through a single disciplinary expertise in the face of the systemic reality as it is beginning to reveal itself to us. In a systemic world, what are the limitations of your disciplinary expertise? I begin to feel that and understand that. That of course takes us directly to a critique of the enlightenment and the system of knowledge that comes out of the enlightenment and the limitations of that. Now, we’re talking about starting to understand the need for a post-enlightenment knowledge model and that includes a post-Kuhnian aesthetic model and what would that be? I think that in many ways, I’ve moved from like so many people trying to understand the nature of the condition and the limitations of the knowledge system that we had inherited in the developed north and questioning what another approach might be and what that would look like and then beginning to try to figure out what does that mean for art? What does an artist know that can contribute to the sustainable future? What will we need to do? What bad habits do we have to change? What intellectual errors do we have to correct and what creative possibilities, new creative possibilities are revealed that didn’t seem to exist before which is the part that’s so exciting? Sam: I’m not going to get in trouble for quoting this back at you because it is on your website. What do artists know? Frances: This question, “What do artists know?” began as my private question at the beginning around 2000. Tony Fry is talking about the technosphere, semiosphere and the biosphere and he’s laying out these Venn diagrams. We all know about the triple bottom line and then thank goodness, John Hawks comes up with the four pillar model and at least there’s culture there. Actually before I saw Hawk’s model which is so clear and useful with culture as a pillar, the place that I saw that I could enter was the Guattari based model that Fry was using which included the semiosphere. The semiosphere as the realm of the intangible realm of values and meanings, it was very clear to me that as an artist, I had knowledge and expertise of navigating within the semiosphere because art had become primarily a symbolic economy of culture. We were specialists, you might say. Artists, cultural workers are specialists in this symbolic economy. How could I take that expertise and contribute it and thus my question, “What do artists know?” What we’re really talking about is not the explicit knowledge of artists. Artists know how to mix yellow and blue paint and get green. We know how to weld. We know the history of art. We have explicit skills. What we’re really talking about are the tacit methodological procedural knowledge and skills. These are much more difficult to track down. I had a really interesting thing that happened along these lines. I had entered into a two-year conversation early on in this new work that I’m doing under this knowledge platform. I entered into a two-year conversation with the city planners in the city of Cleveland. Classic legacy post-industrial city on the great lakes, steel city, highly polluted, needs a new economy, losing population, classic so-called shrinking city. We’re talking about all of these things and doing this two-year period with these … This was the director of Cuyahoga County planning, the director of Cleveland Parks, Cleveland Metro Parks planning, very level thinkers. It was quite an intellectual conversation. They began to tell me what they think I’m contributing to their thinking. I made a little Word document on my desktop, on my laptop called What Do Artists Know? They would tell me something and I would write it down and then maybe two months later, they’d say something else and I’d write that down. Two months later they’d say something else and I’d write that down. I was just keeping this as a private document and putting it in my own words what I thought they were saying. One day after two years, I looked at this document and there was a full blown document there. I had no idea what it was. It was called What Do Artists Know? You can actually see this online, you can find it. It’s around. I’ve kept the date of 2006 on it. Sometimes people say, “We should go back and work on this language to clean it up a little bit but I feel like as a historical document. I don’t touch it because it’s just the way it arrived to me. The language is interesting because I was very involved in learning their language and they were very much influenced by what we could call innovation speak. This document is a little bit art speak and a little bit innovation speak. Sometimes people get agitated about its oddity in that way. It’s part civic, part art mashed-up together, a linguistic mash-up. This document knocked around in my life for several years and then one day Chris Csikszentmihalyi who was at MIT Media Lab told me one day that he knew what this was. He said, “This is a knowledge claim.” I thought, “Oh, that’s interesting. What the heck is a knowledge claim?” People would say that they’d call it a manifesto and I knew it wasn’t a manifesto. I mean, it’s written a little but like that but it wasn’t really a manifesto. The idea that it was a knowledge claim document was a terrific thing for me because, A, I learned a new word called the knowledge claim but it began to let me understand that this was tacit knowledge. From there, I was able to apply a whole body that’s coming … At the time I was reading these crazy things that you’re probably aware of called knowledge management or change management. This was just emerging out of business schools and the like. Of course this is really not what most artists are thinking about. Yet the history of the avant-garde is nothing more and nothing less than a focus of value proposition on newness and so I began to realise that the experimental thrust of modern art, of contemporary art, the history, the intellectual history of the avant-garde was connected to this idea that something new, something innovative, something experimental would be one of the prime criteria for art and that that might be interesting or useful mapped on to the idea of civic innovation. He said, “Oh, you’re right. Let’s do it.” This thing called the Embedded Artists Programme which is a platform for using artists and bringing cultural perspectives to the daily work of the city was born out of this accidental knowledge capture into this document. Sam: The Embedded Artists project, what sorts of things that people get involved in? Frances: The pilot programme which ran in Chicago from 2008 to ’12 was just two artists, myself and another artist. I worked principally at the beginning in the planning office working on the 20, 40, food plan and the idea there would be that I could help them understand the cultural dimension of food planning. However, that engagement was not so fruitful because the outcome was already determined which is to say we were going to write a planning document and I just became one more researcher. The next question was, “How can this city get practical experience doing an alternative remediation type?” For example like fight over mediation using plants which is what we ended up doing because I work a lot with plants and so I thought, “Oh that’s something that I can contribute to.” Then the third question was, “What can the city do with their 400 plus abandoned gas stations?” Which were all over the city, they revert to city ownership because when the tanks leak and people can’t clean them up, they stop paying property taxes on them and so they revert to city ownership. The city ends up owning all these brownfields, small brownfields, small contaminated properties. What do we do with them? Having given us these three questions, she said, “Okay. Go off and come up with something.” In that framework because it was so open-ended, we began to work on possibilities and came up with this programme called Slow Cleanup and in Slow Cleanup, we realised that if we could identify a much broader range of plants that can clean up petroleum, that we could create a wide range of new urban landscape topologies in the city. We work with the soil scientist and AP Schwab, Dr. Schwab of Purdue University and tested 80 plants, 80 native ornamental plants that had never been tested for petroleum cleanup. We did identify 12 new ones and with the likely prospect of quiet a few more. We didn’t invent the science, we just applied the science to a new set of plant materials knowing that that would then facilitate a whole new kind of urban design. That was a really terrific outcome. There were all kinds of secondary knowledge that were produced. For example, we figured out a new soil prep method that kept all the soil out of the landfills. We involved students in from four communities of practise in the project so value was created at every step of the project. Sam: That has led to larger scale work. I’ve been looking at pictures of The 606 collection of projects. That’s a large park. Frances: Yes, it is. Three miles. Sam: How did that come about? Frances: There were a number of steps between the gas station project. I went off and did a project with Lima, Peru and did some other projects with other city governments but eventually got pulled into The 606 in an interesting way. The people that were doing The 606, it’s a public private partnership so that was the trust republic land, the city of Chicago and the Chicago Park District. The 606 which was originally called the Bloomingdale Trail because it was on Bloomingdale Avenue, is a rail to trails conversion project. It’s an elevated train line, train spur and it was being turned into a bike path and greenway. There had been a phase one which was the public consultancy project and there was some dissatisfaction among people in the city with the level of ideas that were being put forward. I was hearing quite a bit about this and these were the same people in the city that the people from planning that I had done on the food project and the people from Department of Environment, these were the same people involved and they were dissatisfied with where it was going. The project that we did in Cleveland actually involved the trail even though we ended up working slag cement instead but I had produced quite a few documents about integrating art and cultural perspectives into a bike trail. Lo and behold in the next few weeks after giving away all of these good ideas, they came back to us and invited … They came back to me. I always say us because all of my work has become a plural so I just don’t even use the pronoun I anymore, but in this case, they came back to me and invited me to be the lead artist for the design team, the phase two design team which was the team that was going to actually design the trail. What was interesting here was that because there had not been enough ideas in the phase one we had to do the phase one and the phase two at the same time. It was very fast, very large. It’s a three-mile stretch of city and a fairly contentious process and just one thing about that. There was an artist in phase one who was a terrific artist but they had not been working at the scale of the city. They had been working with murals and community-based projects. I think that the reason that I was able to help them in a different way was because I had done these other projects that had ramped up the scale at which I could be created. I had done it gradually overtime from the Cleveland project, the gas station, the work in Lima. By the time I got to The 606, I had figured out how to think at that scale. Artists are not trained to think at that scale, urbanists are. Even for the landscape designers and the engineers, there were 38 bridges on this project, three miles of landscape. It goes to four distinct neighbourhoods that are quiet broad in their profiles. Being able to work at that scale allowed me to do something that I couldn’t have done 20 years before. There was a direct link between Embedded Artists and The 606 in that they came to me because I have that capacity. Sam: Ramping up the scale in which you can be creative, this is not you painting large areas more quickly, this is changing the way in which you work? Frances: Correct. Yes I am coming out of sculpture and the built world and gardens. I’m talking about the work that I do is with soil and pavement. I consider sculpture one of what they called world-making traditions in terms of the built world. I am not my own work. I do some drawings. It’s funny coming out of printmaking but it’s so long ago. My work is with a three dimensional world and living systems with plant systems and water systems, et cetera. By this time I have got quite a bit of experience doing that. Sam: If you have to classify it, you see the whole park or the whole or the whole bits of the plant perhaps as sculptures. Is that how you see it in your head? How does it work? Frances: It’s interesting. The nature of this thing, it can be seen in many ways. It is a transportation quarter. It is heritage infrastructure. Some people likened it to a charm bracelet with charms along the way because there were many, many different pocket parks and sites and interventions. Some were pure designs, some were pure art. For example, there are four locations for large scale commissions, art commissions. Inside that would happen at a smaller scale than what I was operating, but in another way, I did actually without telling anyone conceptualise it as a three-model sculpture. It was a little game I played with myself. At one end, we have an observatory and it is a convex mount. The other end, we had planned a skate park which was not really a skate bowl, it was a plaza style skate park but it was concave. Then perhaps my signature idea that has the most of my intellectual DNA on it is a planted line that runs the full length of the trail that connects the two. This planted line is a climate monitoring planting based on what’s called phrenology which is where you look at bud burst to see microclimate. Because we are east-west in relation to Michigan, the trail is a climate monitoring instrument de facto because of this floral planting that we put. I didn’t really call out to anyone that if you think of … Maybe you can imagine this. If you have a ball at one end and a ball at the other end, concave and convex mirror images of themselves, connect it to a line up the middle, you basically have a baton shape, a three-model baton shape. I never call that out to anyone until it was all done because I thought that … It started because we were doing a line and we were doing the observatory. Then when the skate park happened I began to realise this form was shaping and it became a fun game for myself to see if I could pull it off. I didn’t tell anyone until it was all done and when I did, there was an audible gasp in the room because I thought it would seem megalomaniacal to say, “And by the way, I just made this thing into a three-model object.” It was a fun game for me to think in those terms. I don’t know if that’s what you’re talking about. Sam: How do you go about making a city sculpture? if you were commissioned to make a sculptural whatever, is it the same sort of process for approaching a city degradation problem? Frances: What is sculpture? You’re talking about sculpture as an object, but sculpture expanded beyond the objects many years ago. In the early 70’s, Rosalind Krauss wrote an article called Sculpture in the expanded field where she was talking about art works that had already become earth works, site works and sculpture was returning to its relationship to landscape and architecture which of course is where it was until 100 years before because if you think about the public monument which has an architectural base and maybe it’s a got a guy on a horse or something, this commemorative monument that was always sited, contextualised part of public memory. It was civic. It was frequently tied to some kind of celebratory memorial nature. It was tied to the architecture of the space around it and this thing that we call the sculpture was contextualised in relationship to site and architecture. When sculpture came off of that kind of work and jump off the pedestal and then ran into the art gallery, it left its relationship to place site, civic, and architecture and landscape. It left all of that. By the 60’s and 70’s sculpture was running back out the door and trying to reconnect to all of those things. Krauss calls this the expanded field. In many of their minds, the field of sculpture, we call that the Big Bang or I do anyway and call it Big Bang Moment when sculpture re-expanded and has really just kept expanding. Even though there are people who make objects called sculptures, the field of sculpture has now expanded into what we call sculptural practises or a whole series of expanded practises, critical practises. This includes artist working like I do in ecology, artist working in an urban conditions, artists working with what’s called social practise, artists working with media performance and film video, artists working in all kinds of expanded practises. In many art schools, this lives in the sculpture department. Why does it live there because sculpture is the big tent. It’s the place where whatever goes on in the world, goes on in sculpture. Sculpture as a discipline has become this broad enterprise of practises that include object making but are not limited to it. It’s the home for all of the artistic orphans that don’t seem to go anywhere else. We sometimes joke that if isn’t a painting and it isn’t a photograph and it isn’t something else you can name, it’s a sculpture. Sam: Back to your question, what do artists know? If you were the city planner who’s been told to sort out derelict areas, suburbs, something, why should you involve an artist? Frances: Several reasons. One is for their cultural literacy. For example, if you want to pull forward, contextual dimensions of the site, of the population of the community, this would be a great way to do it. Second reason would be if there are technical challenges about this site, it floods, it’s contaminated, it needs economic revitalization, something and people have tried conventional methods and they have failed. Now artists are not miracle workers but sometimes we have other ideas about things that could be tried. This could be understood as an innovation, but the artists frequently think about things differently and they might see other possibilities. This is what I call the imaginative potential of our artists to deal with issues that where other people see no solutions. Sometimes this is because artists may understand the nature of the condition differently. We call this problem finding rather than problem solving. Maybe it’s not about solving the problem, maybe it’s about understanding that the problem is actually a symptom of some other condition. Artists have been very good at doing a different kind of analysis of what’s going on such that they might be able to offer a different approach. Sam: You may or may not get “artworks” out of that? Frances: The artworks is a completely different question. On the one hand, we’re really talking now about the artists as cultural agent. We’re not talking about the production of artworks. Now, we could say many years ago, it became pretty obvious and this is really a function of logic that the only place you can get art is from artists that there is a necessary and sufficient condition between artists and artworks. What is art? It’s what artists do. What are artists? People who make art. When you involve artists, you could argue that in some way you’re going to get something we could understand as art, but this frequently gets you mired in the question where people want to argue whether or not the product is art which I find a really unproductive place to head. I have turned off the question of art. I changed the channel. I like to say for sure I’m an artist out of habit training and inclination and for sure the work is cultural. The question of art, who knows? Too soon to say. Sam: You talked about ramping up the scale at which you could be creative and you’re currently working at the city suburb level. Can you keep going, scaling up? Is there an optimum at which you think you could operate? Frances: Interestingly, I’ve gone the other direction. After working on The 606, I came away from that project longing to work at a more intimate scale. That and a number of other factors have led me to work around the bottom of the lake in Gary, Indiana. Gary is a smaller city. It’s lost population. It has a lot of available land that needs re-imagining. It needs a new economy because Gary was built as a steel city. US Steel, it was a company town and like it has suffered the faith of company towns. When steel production moved elsewhere, the economy fell apart. People with options left and the people who don’t have as many options have stayed. Gary as a city has got a very extreme version of the post-industrial issues of cities in the great lakes. This has captured my imagination but it also is a place full of possibility. When I did the climate monitoring planting on the 606, the plant that we used called the apple serviceberry, the Amelanchier x grandiflora is actually a member of the apple family. The reason that it’s a great climate indicator is because it’s temperature sensitive. Most fruiting plants are temperature sensitive because the way they bloom, they have to bloom after frost in temperate climates, after frost has passed so that the frost doesn’t kill the fruiting bud and then the fruit. They’re great climate indicators because of that and there also they tend to be beautiful. We all know about the famous Japanese Cherry Blossom Festival which was actually the source, this source idea for that project because people don’t know that the cherry blossoms, the Japanese have … It’s a cultural festival. They have been writing down the bloom date of the cherry bloom since 720 AD. That dataset is one of the most important climate datasets that we have and it was produced by culture. It was by the appreciation of beauty. It was not produced by science and it was not produced by social responsibility. Part of what I had been interested in is can we use this beauty, this engagement with the blooming spectacle to raise consciousness and to engage. On The 606, it was used to raise consciousness of the proximity to the lake and the lake microclimate, but that became … I was calling pink infrastructure, infrastructure for climate awareness. I really wanted to extend that idea. Part of my interest in Gary is that as you moved east around the bottom of Lake Michigan you move towards the Michigan fruit belt. The soils under Chicago are clay, but as the time you get to the bottom of the lake, they turn into sandy lake plain soils. You have the advantageous microclimate tempered by the lake, but you also have improved fruit soils. I began to wonder if a new fruit economy could be … An improvement in the food shed could be developed in Gary. Because I was interested in working at a smaller, more intimate scale, the project that I’ve started with some other people there in the community is a community orchard. Rather than start this through the city even though I’m in conversation with the city and they support the project and they’ve given us some parcels and we can’t do it without them, I am really playing this through the local community. We identified some master gardeners and environmental specialists that live in the neighbourhood and we are it very much bottom up and a small scale and if we can do this orchard as prototype, we might grow ourselves a big programme but we’re going to do it in the opposite way from The 606. Sam: I have some questions to and with. What’s your go-to definition of sustainability? Frances: I hear people say that no one knows what it is. I think this is absolutely incorrect. I think that lots of people know what it is. It’s aspirational. What we don’t know … To me sustainability isn’t aspirational statement. What we disagree with what is contentious is what might the model be. What would be the important components. That’s where you always see those Venn diagrams and then how do you model that in reality, what does that look like? I find multiple models of sustainability useful. I really like the Guattarian model that I mentioned to you, technosphere, semiosphere, biosphere, that model. The idea of attending to all of those systems but that is really academic and abstract. A lot of people for example in business and the city can’t deal with that. They want to use the so-called triple bottom line and it’s been very useful for me just to add the fourth pillar to that. I think critical because one of the problems with the triple bottom line is if you look the qualities, they want it to be viable something unbearable. I think the word is bearable. Who wants to live in a world that … I don’t aspire to bearable. It sounds dreadful. Frances: Hardly inspirational. Quality of life has to get in there. We’ve got to have that hopeful vitality piece. To me, this is not mysterious. It is not difficult to explain what it is. If you understand it is aspirational and what’s difficult us getting people to change their behaviours. Sam: We’re writing a book of these conversations. We’re calling it tomorrow’s heroes. How would you describe your superpower? Frances: You mean what I think I’m really good at? What do you mean by superpower? Sam: What are you bringing to this good fight? Frances: I am a really terrific documenter. I joke that I’m an expert generalist. I think that this actually, this dot connecting and this double agency that I mentioned, comes directly out of the knowledge of the way artists are educated and trained. The ability of artists to see connections among what we might call asymmetrical data. We are excellent at pattern and system recognition, dot connecting and that ability to synthesise things that don’t seem to go together I think is something, maybe our best trick. Frances: I think the climate monitoring planting on The 606 would have to be up there. The reason for that is I’m going to be dead and off the planet by the time we know whether or not it worked, but if the Japanese Cherry Blossom Festival can produce climate awareness but in an embodied way, in a deeply cultural way, the idea that these floral display along this bike path might change consciousness in a way that is beyond language, beyond mere quantification. I think we have a shot at that. It seems almost inevitable if we can get the plants to become established and to live. I think that that is bound. I’m convinced that will do its magic with or without a citizen science programme, with or without anyone even knowing it’s working. I don’t mind that subversive approach. I don’t mind not having people know that anybody had that in mind. Frances: I do consider myself to be an activist now but in that way that we described earlier in that subversive way that I am interested in changing people’s behaviour. I am working for the nonhuman users of the planet, not just the human users. I’m interested in doing something that actually changes the future and not just changes the short-term political conversation. Sam: You might have just answered this but what motivates you? Frances: I think I just answered this. The nonhuman users, that’s what actually motivates me because we’re taking … if we survive, we’ll survive but we will take out a lot of species with us and I actually find the ethics of that intolerable. We have to get our act together. Frances: I think this new orchard project of the idea that there might be a small fruit economy to be had in this area that really needs … The people there really need new options and I’m very excited about … I consider it about a 10-year project. One thing we didn’t talk about, I don’t think, I’m very interested in this idea of long time, working in long time. We live in a culture of tweets and short political cycles and short media cycles and yet climate change, fruit growing, consciousness, these things happen in long time. I’m really interested in working in these projects that unfold over a long period of time and change people’s conception of time. I might even say that working with time and space as malleable plastic media is the new sculpture. Sam: Are they going to be unfolding over such a long time that you have to relinquish the artist tag on them because all the people are going to be changing it over time. Frances: I already have. What we’re saying about the project in Gary because I’ve already began speaking about what our creativity model is and we’re calling it co-creativity. The very first thing that I did when I got this idea and we were seeking some funding for it is identified my core community partners and invited them to join me in what we’re calling the community orchard collaborative. Walter Jones who’s a long term resident of the Emerson neighbourhood. [Deb Backus 00:55:05] who’s a resident and the environmental engineer. I invited them to immediately become my core collaborative. From the beginning it must be co-creativity and with the city partners because this is not Frances’ orchard. That makes no sense in any way including the question of what happens as I age? By the time the fruit is ready to produce, I will be in my 70’s. It’s got to belong to someone else. Sam: It’s got to belong to people who aren’t born yet. They have to see it as an artwork? Frances: No. I don’t even talk about it as an artwork. Sam: They have to see it as something they want. Frances: Most of what I’m talking about does not need to be seen as an artwork. For people interested in art in the future of art, we can go often talk about it as an artwork but the principal thing is for them to see it as an orchard and we are going to plant in a little bit of an unusual way in a wedge that shows the time that different plants take to become productive. It will form a green wedge that likens itself to the progression of time and our motto is it’s about time. I think that people will see it and go, “Oh, this is a little unusual. This is a little different.” It will be very legible, the time factor in this. That might make them talk about whether or not it’s an artwork. I don’t know but for me it’s primarily making time legible and it’s really a form of embodied environmental education and that’s what’s important about it. If we don’t produce any fruit, it’s all for naught. It’s got to be a productive fruitscape or else what the heck are you doing. Sam: Two more questions. If you could wave a magic wand and have a miracle occur, what would it be? Frances: Orchards all over Gary. Sam: Lastly, do you have any advice for our listeners? Frances: I have an insight that I’ll offer up and people can chew on it over their breakfast cereal if they’re so inclined or whatever and that is that all of human activity is essentially cultural that it is all artifactual. It is all cultural. We need to see ourselves as the way anthropologists would see us. if we can begin to see ourselves, the way anthropologists would see us and see that all of our activity is cultural, is part of the semiosphere that we would begin to see how value driven our decisions are and maybe have a better chance at understanding how to change our behaviours towards something more sustainable. Frances: You’re welcome. Thanks for having me. Sam: You’ve been listening to Sustainable Lens: Resilience on Radio, a weekly show on sustainability topics brought to you by Otago Polytechnic. The show is co-hosted by Shane Gallagher and me, Samuel Mann. We’re broadcasting on Otago Access Radio, oar.org.nz and podcast on sustainablelens.org. On sustainablelens.org we’re building up a searchable archive of conversations with people from many different fields who are applying their skills to a sustainable future. In our conversations, we try to find out what motivates them and what it means to see the world through a sustainable perspective, through their sustainable lens. Tonight’s sustainable lens was that of Frances Whitehead, a civic practise artist from Chicago and Gary, in the great lakes basins in the USA and professor at the School of the Art Institute of Chicago. So many things there I really like. I like the last thing that we just talked about making time legible. I liked that idea a lot. You can follow the links on sustainablelens.org to find us on Facebook to keep in touch, and you can listen to Sustainable Lens via iTunes and other places as well. That was Sustainable Lens, I’m Samuel Mann. I hope you enjoyed the show. 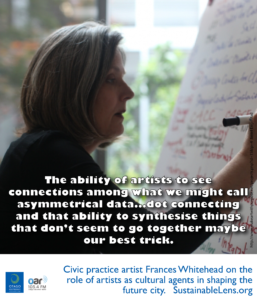 The image of Frances Whitehead is from Janeil Engelstad on Make Art With Purpose.